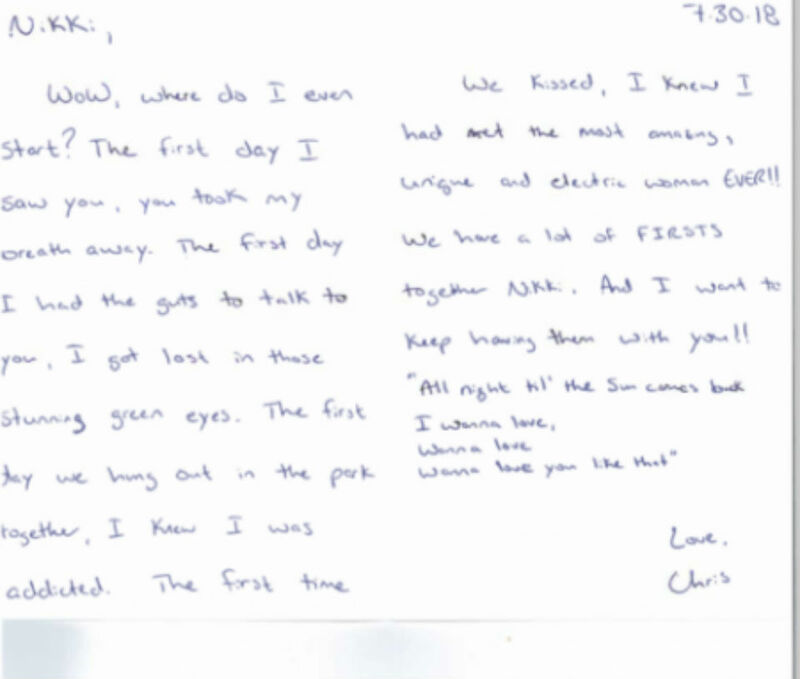 While his wife and daughters were visiting family in North Carolina this summer, Chris Watts was carrying on a romance with a woman he had recently met at work — and sent her love notes and cards as his wife, Shanann Watts, began to wonder what was happening to their marriage. 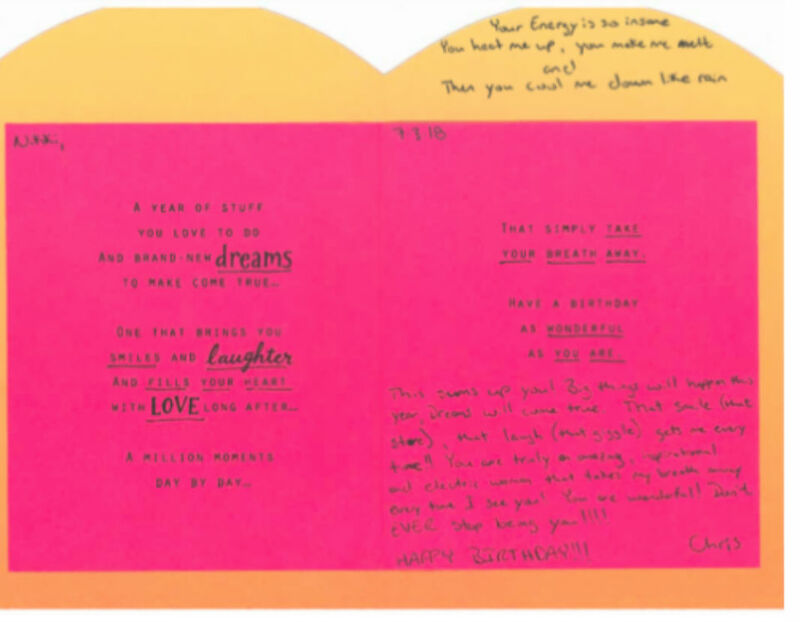 The Greeley Tribune has obtained images of a birthday card and a handwritten letter Chris Watts gave to his mistress Nichol Kessinger, who told investigators she had no idea Shanann Watts was pregnant and believed that Chris and Shanann were headed for certain divorce. 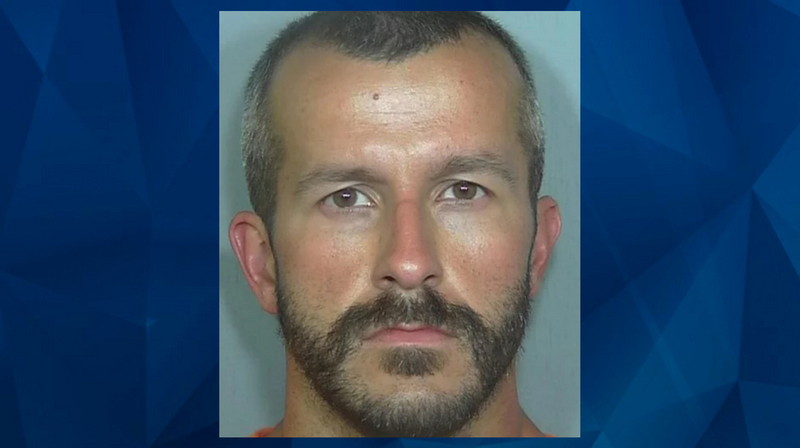 The notes, which are referenced in the discovery documents released by the Weld County District Attorney late last month, appear to show that Watts was smitten with 30-year-old Kessinger, who had a birthday in early July. “Your energy is so insane. You heat me up, you make me melt and then you cool me down like rain,” Watts wrote in the birthday card, according to the Greeley Tribune. “Wow, where do I even start? The first day I saw you, you took my breath away. The first day I had the guts to talk to you, I got lost in those stunning green eyes. The first day we hung out in the park together, I knew I was addicted. The first time we kissed, I knew I had met the most amazing, unique and electric woman EVER!! As CrimeOnline previously reported, the discovery documents show that Chris had distanced himself from Shanann while she was away visiting relatives, and sometimes ignored her messages and calls in favor of communicating with Kessinger. Shanann told friends in text messages that Chris had told her he didn’t believe they were compatible anymore, and had begun to suspect he was having an affair. In the video of Watts’s eventual confession to police, he admits to investigators that Shanann knew in her gut he was seeing someone, but that he never came clean. Shanann and her daughters Bella, 4, and Celese, 3, were murdered early in the morning of August 13. Last month, Watts pleaded guilty to all three murders and was sentenced to three life sentences without the possibility of parole.